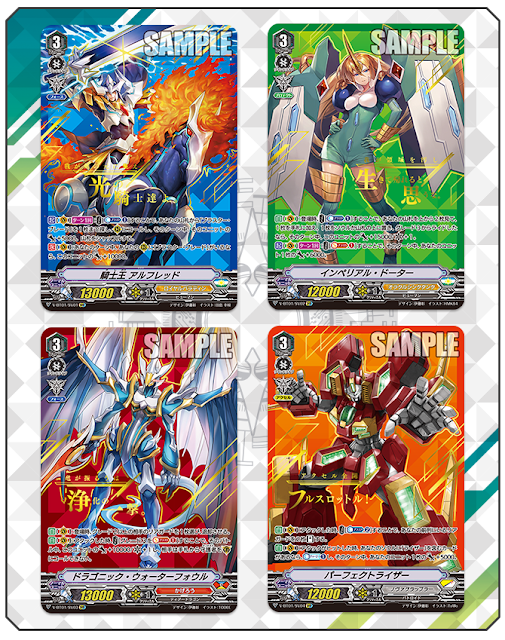 The Japanese Cards of the Day for May 25th, 2018, are a Common from V-Extra Booster 01: The Destructive Roar and four Super Vanguard Rares from V-Booster Set 01: Unite! Team Q4, King of Knights Alfred, Imperial Daughter, Dragonic Waterfall, and Perfect Raizer. Karma Queen is a clone of the Oracle Think Tank card Shooting Bobby. Like all vanillas in the Standard format, Queen's stats are determined by the Gift her clan possesses. 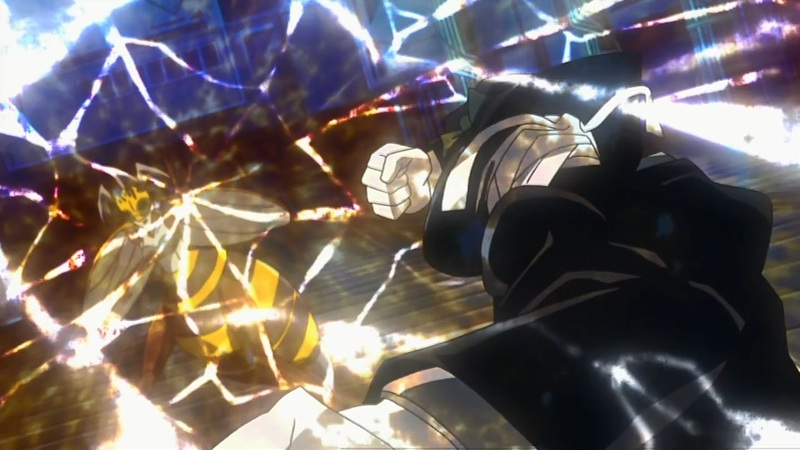 Force clans like Spike Brothers have grade 1 vanillas with 8000 power and 10000 shield, Accel clans like Tachikaze have vanillas with 9000 power and no shield, and Protect clans like Megacolony have vanillas with 7000 power and 15000 shield. In a draw-focused deck like Oracle Think Tank that makes sense, as once the field is filled the excess grade 1s can be used solely for having shield value on par with a Critical Trigger, but because Megacolony traditionally revolves around denying the opponent advantage and conserving existing cards by stopping units from standing rather than on drawing cards, unless we see draw effects comparable to CEO Amaterasu and Circle Magus, at best Karma is likely to be a filler grade 1 when you need to fill out a 13th space and have nothing more compelling to fill the slot. 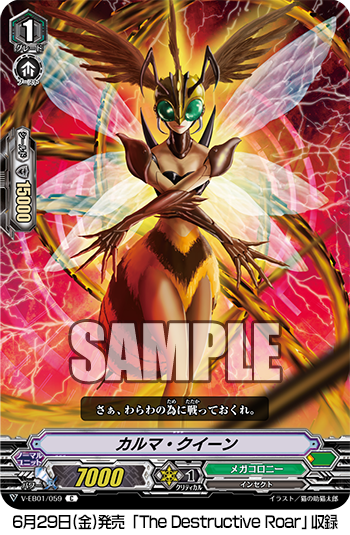 It's a shame because the original Karma Queen was the first card in Megacolony shown paralyzing a unit back in the first Cardfight!! Vanguard anime. While the card was often criticized even in the BT01 days for costing counterblast 2 just to stop a unit from standing, Mr. Invincible decks put her to good use by effectively reducing her cost to CB1. Alas, this time around we'll have to look to other units to fill that role. The lady boss of the crime syndicate Megacolony's armed robbery group. With her colossal wasp minions, she sometimes devours the economy of an entire town. The skills of the SVRs have already been discussed in their respective articles, so today we'll instead touch on rarity. Super Vanguard Rares are 4 per case (4 in 20 boxes) and no box contains more than 1 SVR, making them rarer than Origin Rares but more common than Image Ride Rares. As they are only alternate prints of VRs, SVRs are optional but also ensure each case contains functionally 6 copies of each VR. That means each case sustains 1.5 players for any given clan. The previous Japanese Cards of the day were Funky Bazooka and the four Origin Rares of V-BT01. V-Booster Set 01: UNITE! TEAM Q4 launches in Japan May 25th, 2018, and in English June 22nd. It is accompanied by sleeves based on Dragonic Overlord and Blaster Blade. V-Trial Deck 01: Sendou Aichi and V-TD02: Kai Toshiki will launch in English June 8th. The first Extra Booster set of Standard, V-EB01: The Destructive Roar will launch in Japan June 29th, 2018, and August 2nd for the English-speaking world. The accompanying new anime series, codenamed "Origin," began airing May 5th, with an English-subtitled simulcast on both YouTube and Crunchyroll.